Nasma Residences by Arada ... work in progress. 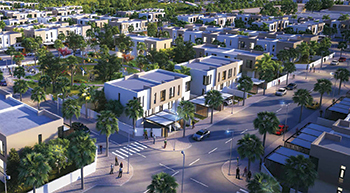 UAE developer Arada has announced that construction of Phase One of its community development, Nasma Residences, is progressing at a steady pace with nearly 60 per cent of the work already completed and on track for handover by the end of this year. Nasma Residences offers a superior location in the heart of one of Sharjah’s fast-growing areas, at the intersection of Emirates Road (E611) and Maliha Road, adjacent to the newly developing Tilal City, Tilal Mall and the recently announced Sharjah Botanic Garden. In addition to the fast-track work, the Sharjah developer is also giving finishing touches to the development’s first completed property, a semi-detached villa, which is now open to the public as a show home, on the north-eastern corner of Nasma Residences. The rapid construction progress in Phase One of Nasma Residences has been matched in Phase Two, where development is now 20 per cent complete. Meanwhile, work on Nasma Square, the 6,500 sq-ft shopping mall for the community, has reached the project’s first floor, and is expected to be completed by the end of this year. Arada has also confirmed that over 500 homes have now been purchased at the community, which is now almost two thirds sold out, says the top official. The news comes following the launch of Phase Four sales in July, which also saw the introduction of the Bareem Townhouses, a stylish collection of competitively priced two- and three-bedroom homes at the project. Launched in March 2017, Nasma Residences sold out the first of the community’s five phases in less than a month, making it the fastest-selling residential real estate project in Sharjah. In total, Nasma Residences contains more than 800 homes, as well as Nasma Square, a fully fledged community centre, and a Gems international school. The entire project is scheduled to be completed by the end of 2019.